You are here: Home / Dog Articles / Is a Big Yard Just an Excuse to Ignore Your Dog? 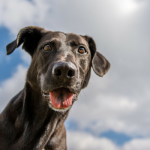 Have you noticed how often the term “big yard” is mentioned when it comes to adopting a dog? “Oh Fido would benefit from a big yard to run in” I know we mean well by desiring these things for our dogs, but having a big yard does not guarantee a dog will be well taken care of. It reminds me of rescues requiring potential adopters to have a fenced yard. 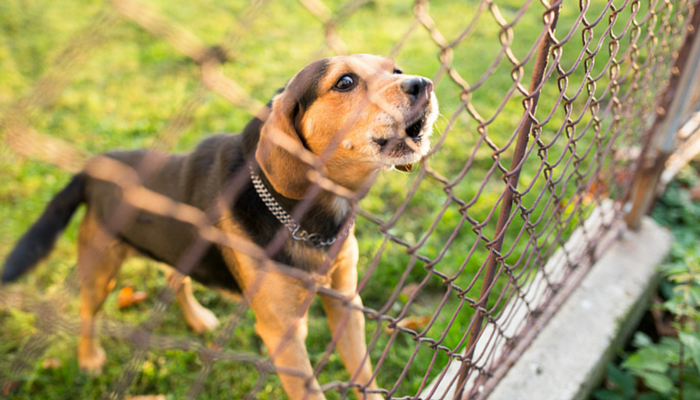 Having a fence is not a good indication of how an owner is going to treat their dog. Is a big yard or fence nice? Of course, but they’re luxuries, not necessities. Dedication and commitment make a good dog owner, not their yard. Unfortunately from what I’ve seen in my neighborhood some people seem to think their big yard is enough. They seem to be under the impression that their big yard is all a dog really needs. This is an open letter to the owners of the many crazy, barking dogs I walk by every single day. Yes, you have a big yard, but now I’m starting to wonder if having a big yard just became another excuse for you to ignore your dog. I see your dog every single day, and from what I can tell I might be giving him more attention than you do. On the positive side I’ve gotten plenty of practice training my own dog to be less reactive to yours, but it’s still not something I like to see day after day. Yes, I’ll continue to pet them if I know they’re friendly, and yes I’ll continue to talk to them nicely to make their tails wag. But no, your lonely dog is not a happy sight to see every day. And I know what you’re thinking; being fenced in isn’t as bad as being chained up. You’re right that it’s not as bad, but it’s still not a fun way to live. Maybe you didn’t realize it when you got them but your dogs are social creatures – they actually like human attention. I know that as long as a dog has food, water, and shelter you’re complying with the law. It’s not considered “cruel” to leave him alone outside all day… but come on. 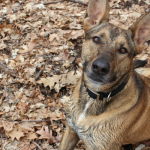 Your dog is not a livestock guardian, and unless you count running along the fence and barking all day as his job yours is pretty aimless and frustrated. Dog’s don’t get all the exercise and stimulation they need by being alone in your big yard all day long. They need companionship, or at least a little attention and fun now and again. By ignoring your dog you’ve created frustration, for both your dog and all of your neighbors. Dogs are social animals, your “wild” Malamute included. Try a nice long walk, cuddle on the couch, a game of fetch, or a nice stuffed Kong to keep him busy. Some interaction will do him good, and you might just be surprised at how awesome he really is. I walk by your dogs every single day and get frustrated – not at them, but at you. You’ve turned them into a nuisance. They run along the fence and act a fool, which of course sets my dog off. But how could I blame them? They’re bored, they’re frustrated, and they’re making their own rules. They’re digging, barking, lunging, and running along that fence all day long. Part of responsible dog ownership is showing them what to do and how to behave, but you just ignore your dog. Sure you’ve got the food, water, and shelter part down, but dog’s need more. Your big yard is nice, but it’s not enough. Dogs thrive with a routine; and me walking by yours is now part of theirs. How sad is that? And more than just craving a routine dogs really love having things to do, and when they get to do those things with their human it’s even better. According to a recent study the amount of interactive play a dog receives is a pretty good indicator of his quality of life. That’s what we bred dogs for, to either work alongside us or be our companions. A dog that’s alone and ignored doesn’t have a chance to be either. If you know of any dogs in the Detroit area that live their entire life on a chain please contact C.H.A.I.N.E.D. 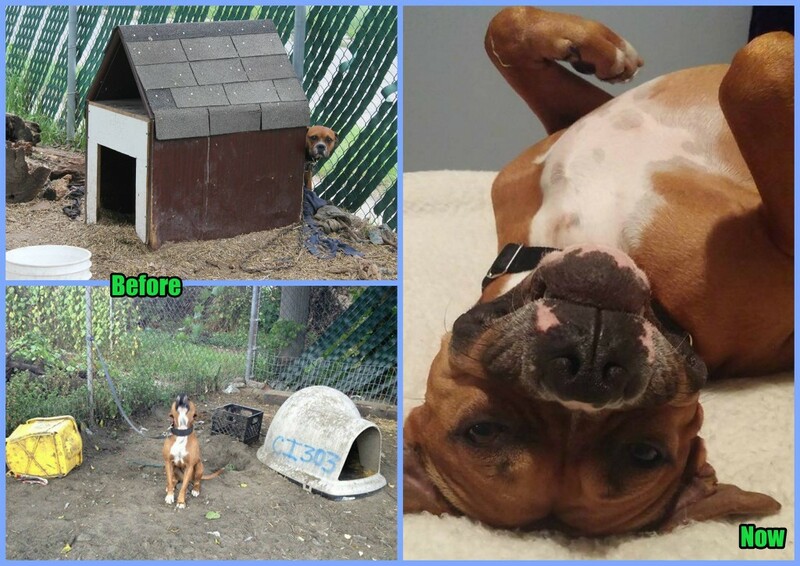 Since 2011 they’ve been working to enhance the lives of dogs by providing insulated dog houses, secure fencing, spay & neuter assistance, vaccines, heartworm medication, treats, toys, food, and owner education to those in need. We have a big yard. It is definitely nice to have it, because it allows us to go outside and exercise and explore with the dog. She is mostly inside though, and I don’t leave her out there and definitely not all day long. Sometimes she goes out by herself to potty, and sometimes I go with her. You make a very good point here! You speak so much truth. It breaks my heart to see dogs left alone in big yards or chained up for long periods of time, if not forever. I can’t wait to get a yard, but Luna will never just be left there alone for a long period. I know she will love the space to run and we will use it to play and train together. The only thing worse are our neighbors who leave the dogs in an outdoor kennel almost all the time with an occasional romp through their yard. Sickening! We’ve called animal control a few times, but nothing changes. Many of the people I consider awesome owners don’t have a yard at all; it’s really sad when places put certain restrictions on owners. I came to a conclusion that apartment dogs are actually better off. They have to be taken at least around the. Lock couple times a day. In the complex we lived, every house had at least one dog. How many do you think one could see being walked? All victims of yards. I tend to agree – the people I know who live in apartments are awesome at taking care of their dogs. The ones I know have made such an awesome commitment to making sure their dogs get out often to explore. That said, I’d love to have huge fenced area to train and play without having to constantly watch for dangers. I’m pretty opinionated on this topic. I definitely do not think a yard is a necessity for the majority of dogs, and I’ve also experienced many dogs left in their yards all day and all night – bored and anxious. I do try to understand that families go through hard times and the dog can’t always be a priority. I’m interested in the work CHAINED is doing to help families in need. We live near a small town and often drive into town to do a “townie walk” with Haley. There are so many dogs left outside in fenced yards that seem frustrated and aggressive. Some are just defending their territory but I get the feeling most are bored and probably pretty much ignored by their families. It is better than being chained of course, but the whole idea of requiring a fenced yard for adopters needs some serious rethinking. We have the big yard. It is fenced, but the dogs are only really out there to do their business or when we are outside working. Sampson does like to snooze in the sun on the deck sometimes. It is nice to have a place to let them out for their last bit of business of the night, or in the middle of the night on those rare occasions, but really they do not spend a lot of time out there and I do discourage their barking. I feel sorry for so many of the dogs I see in and around our neighborhood, I guess the best we can do is keep calling, writing and trying to make a difference. I tried to adopt a Rough Collie from a local rescue, but was declined because our yard was not big enough. I tried to explain to them that the yard was a non-issue for my current 70 lb. Rough Collie boy Atticus, that I take him for a 2 1/2 mile jog every day, and play frequently throughout the day (Tug of war is my favorite!! So much fun for the both of us, and a nice indoor-activity as well! ), as well as as at least one stuffed interactive toy per day. I was really hoping to get Atticus a companion since the local dog park is no longer a safe option, and doggy daycare is too expensive to go to more then a few times a month. I take GOOD care of my dog!! When I first got him at 6 months old he was a wreck! Under-socialized, anxious, territorial, you name it. It’s taken a lot of work, but he’s come a long way in the past 8 months! He’s been to puppy kindergarten and obedience classes, and is now enrolled in a scent-working class just for fun. Training, Exercise, Play, and a healthy diet are things I give my dog every day to keep him healthy and happily, both physically and mentally. My dog falls asleep every night lying next to me a happy, tired dog. I am a GOOD, RESPONSIBLE, LOVING pet owner, and to be dismissed so easily for something so insignificant was extremely disappointing. My vet things I am a qualified pet owner. My trainer thinks I’m a qualified pet owner. I even spoke with my cousin (who is a financial adviser) and asked him to look over my yearly income, bills, taxes, etc. to make sure I could afford another dog. I’m thinking that I should forward this article to the Rescue so they can see that a big yard isn’t the only factor when considering the eligibility of a home. That’s unfortunate that you were turned down. A lot of rescues have certain rules about fencing/yard requirements, and unfortunately I don’t know if there’s an easy way to convince them otherwise. Going from a suburban to rural environment (like I live in now) has shown me that yard size doesn’t have anything to do with how well a dog is taken care of, and in fact lets people get lazy & just leave them outdoors. It’s a tough call, in my situation I did not have any further contact with them. I ended up adopting from the county animal shelter. But with that being said if there’s a way to personally talk to someone about your situation & that you have a chance to connect with them it might be worth it. I just worry that if they stick to their rules no matter what it might bring on more heart ache for you. I have two pit bulls and a mutt and a big back yard. The pits run and jump and chase squirrels and chase each other a lot during the day, the mutt is elderly so they leave her alone pretty much. They’re all rescues adopted as adults and love each other. The pits are inseparable and kiss each other constantly. I’ve never seen two dogs so in love with each other and affectionate towards each other. I can’t walk them every day because of my schedule but they seem pretty active. They also have a doggie door so they can come in and out whenever. And when we are here, they’re inside with us. Something I noticed that tires them out is nosework training. 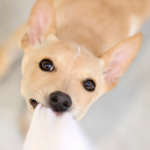 Once basic training is learned, it’s something you can do with your dog inside the house helps them calm down. I hope you didn’t take offense to this article; I’m referring to the dogs in my neighborhood that I see on my walk everyday that are always alone (and when I drive by in the morning/evening). Your dogs sound awesome, and rescuing a bonded pair is something I’ve always been interested in. Your setup sounds perfect. 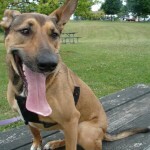 And as far as nosework is a favorite around here as well; Laika goes nuts for it, and I love how calm she is afterwards.